Indianapolis hasn’t hit many home runs this year, even less than Durham, only 20 before this game. But then there was last night and they hit four of them. Overall, eight of the Indians' 12 hits were for extra bases, so that even with the Bulls’ big 4th inning, the team really never had a chance. Leaving the Bulls in time to play in St. Petersburg last night was rehabbing catcher Jose Lobaton. There he went into the game as the DH and went 1 for 2 with a walk and an RBI. Wish he'd hit like that for the Bulls. He certainly is not a loss since he only went 1 for 15, with no BBs and 5 Ks during his stay with the team. Hideki Matsui played in a Bulls uniform last night, but is expected to report to the Rays today. For all the publicity and ticket sales, Mr. Matsui was not particularly helpful to the Bulls either. he was 8 for 43 with an OPS of only .444. He did hit 4 RBI. In exchange for Matsui and Lobaton, the Rays are sending the Bulls catcher Chris Gimenez and everyfielder Stephen Vogt. While I am sure they are not happy about the transaction, I am thrilled. Both Gimenez and Vogt have seen some time with the Bulls this year. I think they are both terrific ballplayers and hope that they get to the Bulls as soon as possible. One Bull is going to have to get thrown off the bus. I’m guessing that Craig Albernaz will once again trek off to “Hudson Valley.” But Mayo Acosta might move down to Montgomery or back to the Stone Crabs. 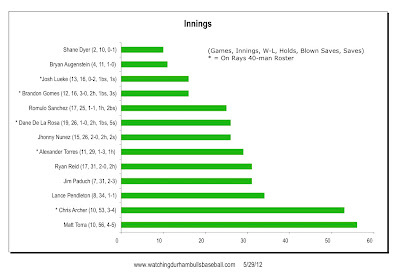 Chris Archer is starting tonight and has been the subject of a recent article that explains the pitches he throws.. Lurking in the Indianapolis Indians bullpen is reliever Jose Diaz. Back when he went from AA to AAA baseball, at the urging of his coaches, Diaz lost 25 lbs to get in better shape. But his fastball dropped from 98 mph to 93. So he put the pounds back on. He now weighs in at 334 lbs. If he gets called up to the Pirates, he might be the biggest guy to ever play major league baseball. Terrific article in the Indianapolis Star. 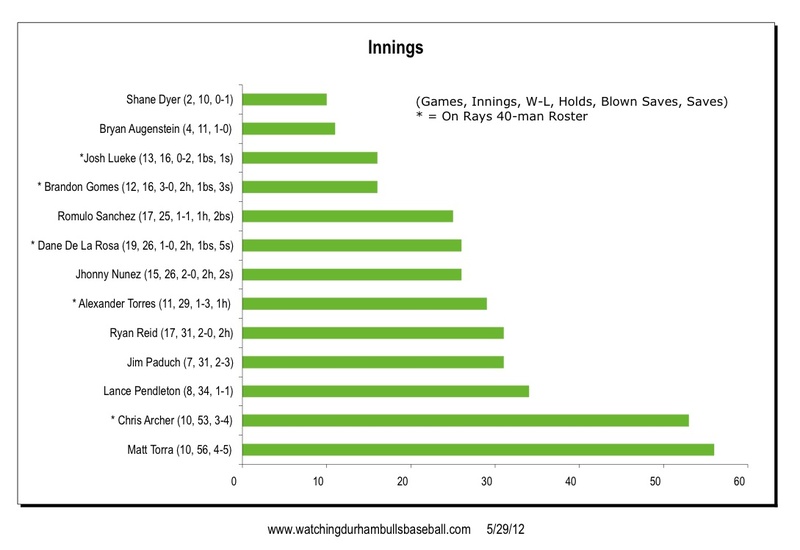 If you hang around long enough, you get to pitch more innings, Dyer and Augenstein are likely to be catching up. I'm still wondering who will drop off of the 40 man to make room for Matsui. Looks like putting Guyer on 60-day DL will do it for them. I thought they'd already done that. Just put something up about Rugg, and a couple of others. Think he went 0-1 last night.